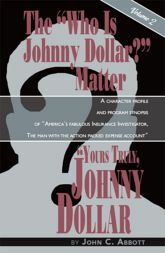 I'm happy to say that shooting started the other day in the form of an interview with John Abbott, writer of The "Who is Johnny Dollar?" Matter. Not surprisingly for the man who devoted so much time and effort to that three-volume chronicle, Abbott was enthusiasm and insight about Yours Truly, Johnny Dollar and its enduring popularity. I'll be posting some clips over the next couple weeks as work on the project continues. In the meantime, if you're interested in the answers to questions like how much expense account money was racked up for any given company, you should check out the book via Amazon or directly from the publisher.